Every year several families of swallows take up residence in the outbuilding where our washing machine lives. We clean the room in spring for the arrival of the birds and they repay us by crapping all over our laundry from April 'til September. This year one of our families seem to have missed the annual migration. 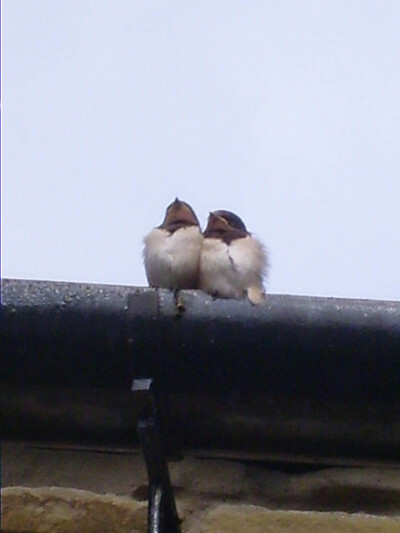 The two 'kids' sit on the guttering all day and wait to be fed. They should be part way to Africa by now. I am tempted to Fed Ex them all to my friend in Cape Town as I worry about them setting off so late. They could be there in 48 hours and nabbing the best spot on the beach ahead of the others. 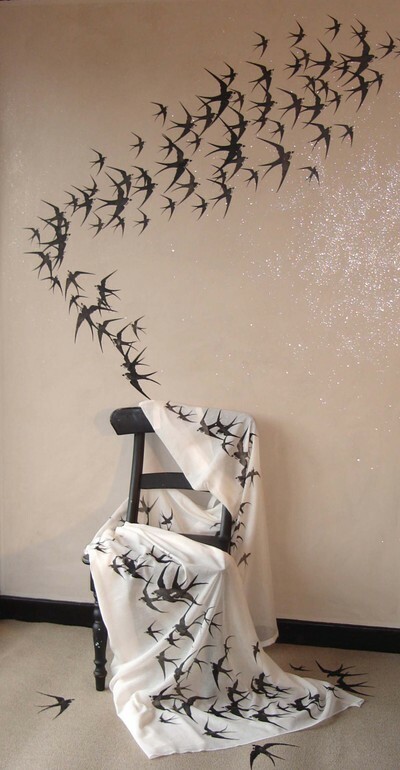 If you like the idea of swallows swooping around your home but without the poop then our swallow stencil might be the solution. I love the way that the design is so versatile. There are three individual swallows in differing sizes allowing you to dictate the height and the direction of their flight. 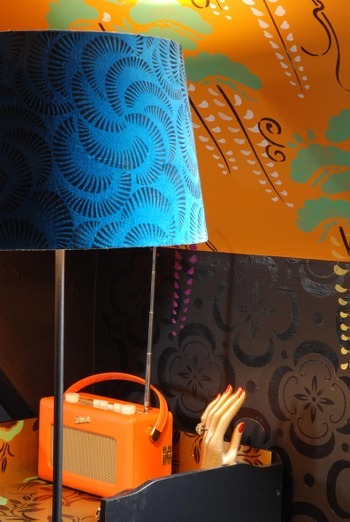 This is what Amanda Koster and photographer Craig Knowles created for Elle Deco magazine with the same design. 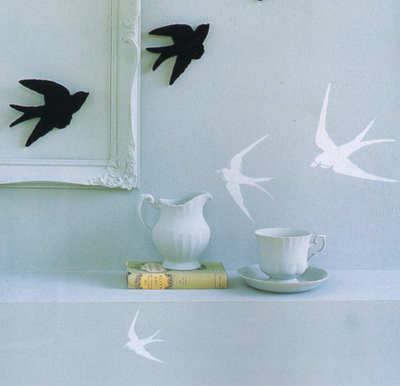 Elle Deco also showed their readers this version of our swallows. 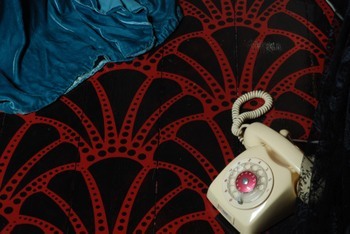 This is part of an image created by Despina Curtis and Jobe Lawreson in 2005. I particularly like the white birds stencilled over blue. 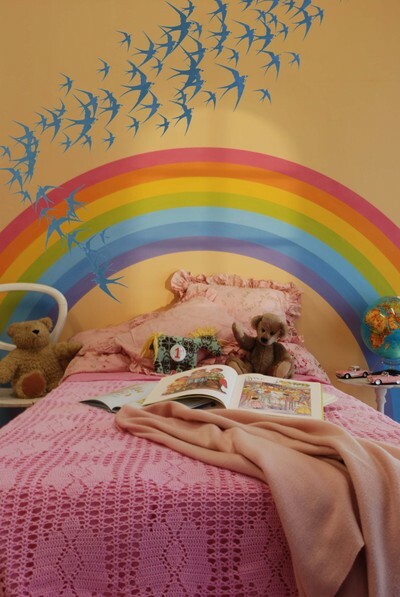 Finally, here is a child's room showing the same swallow as bluebirds flying over the rainbow. Oh, I nearly forgot, there is one more example to show you. I just ran to the house to photograph my swallow skirt. Here it is.. ..it was described by a young lady sharing an elevator with me in Baltimore as 'just the right side of creepy'. 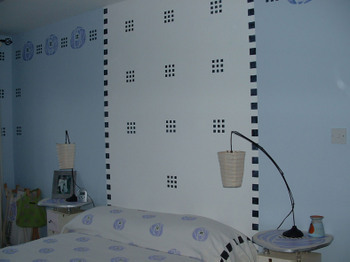 H.
If you want a unique, cost effective and decorative alternative to a headboard for your bed, how about these ideas using stencils? 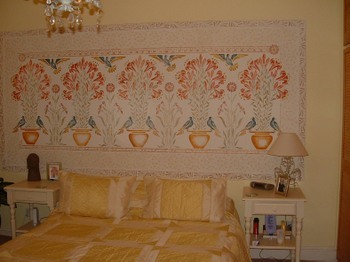 This photo of the master bedroom from my aunt's house, shows a large headboard panel created using three stencils. The main stencil in the centre is DE32 which is an extra wide border. Around that, we repeated the Ottoman Tile OTT36 as a border. Finally, we finished off the panel with the border DE27. This photo shows a Charles Rennie Mackintosh inspired headboard created using elements from our Mackintosh Theme Pack stencil, TP48. We made the stencil at 4 times it usual size (just contact us about custom sizes). We painted the wall white just above the bed. On the "headboard" we used the square geometric elements of the pack. 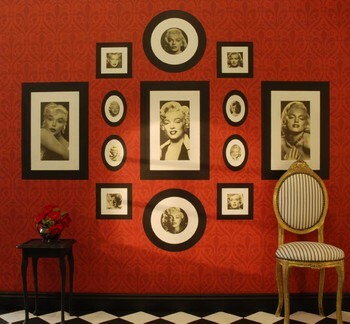 Other elements of the stencil were used elsewhere in the room. 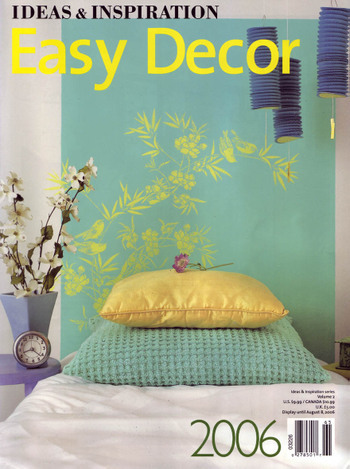 This photo from Easy Decor magazine shows our JA114 Bird and Blossom stencil on a blue background. The stencil has been twisted and turned about to amble across the space. For an alternative on the above, this photo shows and extra large version of JA116 Bird and Blossom No. 3 from the same range as the bird and blossom stencil above. It has been stencilled with iridescent powders which really catch the light from certain angles. 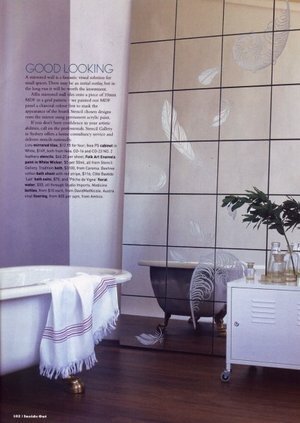 This photofrom Australian House & Garden magazine shows our large peacock feather, CO19-L, "framing" the bed. 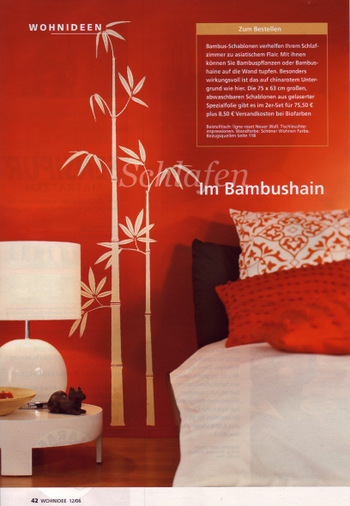 Similarly, this photo from German Wohn Idee magazine shows our JA72 Bamboo Sheets stencil on either side of the bed. JA72 is a set of 2 sheets of component bamboo parts so you can build your own bamboo grove. If you want a less regimented look, you can use the bamboo in different ways on either wide of your bed. 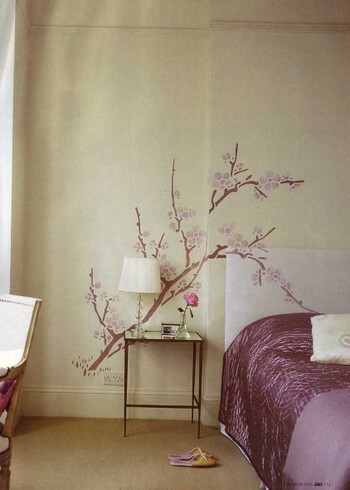 This photo from Homes & Gardens magazine shows a plain fabric covered headboard onto which an enlarged version of our JA138 Cherry Blossom (at 300%) has been stencilled. 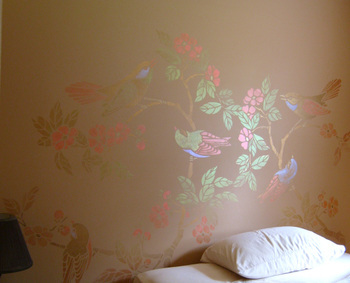 The design starts on the wall and carries onto the bedhead. Finally, this photo shows a bed that has a simple and plain headboard. An alcove has been created by fitted wardrobes on either side of the bed. 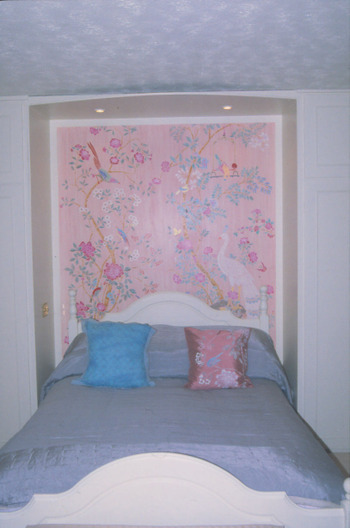 To make the bed more of a focal point and add some interest to the alcove, we stencilled two large Chinoiserie panels, CH10 and CH11, in the space. 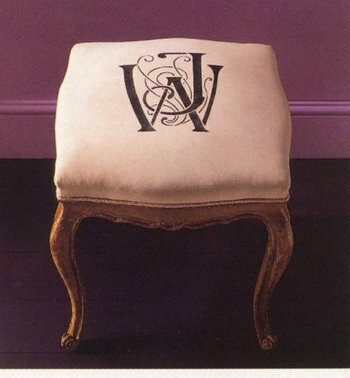 Elements of the same stencil have been stencilled on a matching cushion cover. 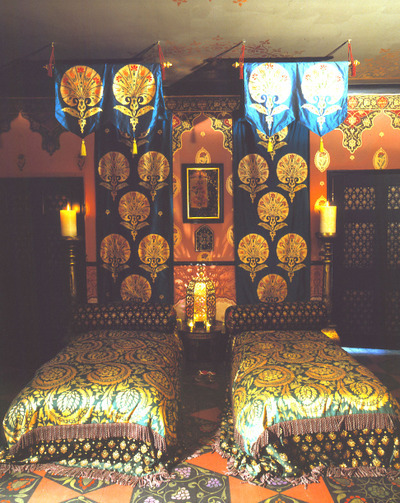 The bed is usually the focal point of any bedroom. Adding a stencilled bed head or surround can really make this area into a fabulous decorative feature. Also, it is also something that can usually be achieved in an afternoon which makes it a great, instant gratification project. 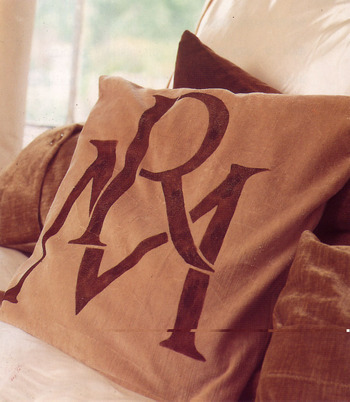 R.
I have always loved monograms and if I had my way, I would monogram everything: linen, clothes, luggage and more. 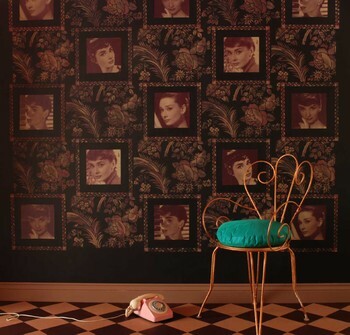 I have even monogrammed my walls in the past. They went on each dining table as well as the cake table. 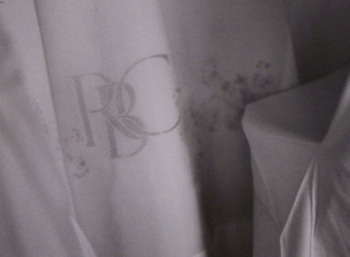 So, next time you really want to give someone that extra special gift, consider monogramming it with a stencil. Please note, if you are ordering a monogram off our web-site and it is one that we do not list letter choices for (because there are too many combinations), don't worry, we will e-mail you to confirm your choice. 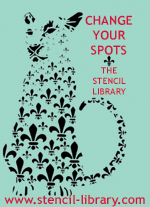 R.
Our newest range of stencils, Print Room, is now on our site! This is a collection of repeats, borders and motifs that allow you to create your own art gallery. The range is split into two parts Contemporary and Classic. 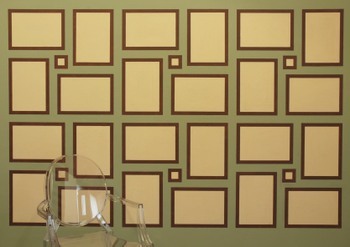 The Contemporary section is a compilation of repeat and border stencils that incorporate a frame shape within their pattern. The idea is to fill these frames with photographs or prints. To see the full range and more photographs, go to ﻿Print Room. Enjoy! R.
The Victoria & Albert Museum in London are just about to open their new fashion exhibiton "The Golden Age of Couture Paris & London 1947-1957". It runs from September 22nd 2007 until January 6th 2008. It will be big so if you fancy going, you will need to book tickets in advance. Helen has already booked to visit later in September and I shall be going later in the year. From what I can see on their web-site, it is going to be fabulous and for anyone interested in fashion and design, should not be missed. (Whilst there, check out the Lee Miller exhibit too). If you are visiting London, you should always go to the Victoria & Albert Museum as it is a treasure trove of inspiring exhibitions. They have a terrific shop and tea room (as Helen mentioned in a previous post). There is a book to accompany the exhibit and if these photos are anything to go by, I cannot wait to purchase my copy. Oh, to have a wardrobe like this! R.
P.S. According to my September issue of US Vogue magazine, feathers are a big trend this season. If you don't fancy actual feathers on your clothing, you could always stencil some on. We have several in our range: CO16, CO19 and CO23, NC127, and TP26 to name a few. The wisteria randomly covers the sides of the ceiling with a few motifs going onto the ceiling itself. 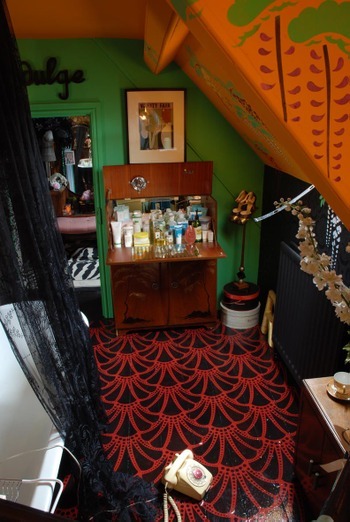 The floor was painted burgundy and stencilled with an Art Deco repeat, DE314, in black. It was given a coat of high gloss oil based varnish to protect it and to provide full-on shine. 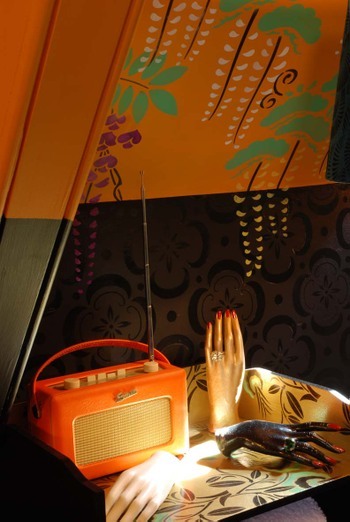 The mannequin hands, which I picked up at my favourite local shop, RE (who also have a website), were moved into this room as a nod to the surrealist artists of the era. It still has the original lemon squeezer and cocktail sticks attached to the inside lid. You never know when you might need those in a bathroom. As before, due to the size of the space, I was fortunate enough to treat this bathroom like any other room and was able to fit a lot of furniture and accessories in it. I dyed the original slipcover on the chaise longue, which was black and white ticking, totally black. I have rehung the "indulge" sign over the door again, as, afterall, bathrooms should be places of sanctuary to indulge and hang out in at the end of a long day. 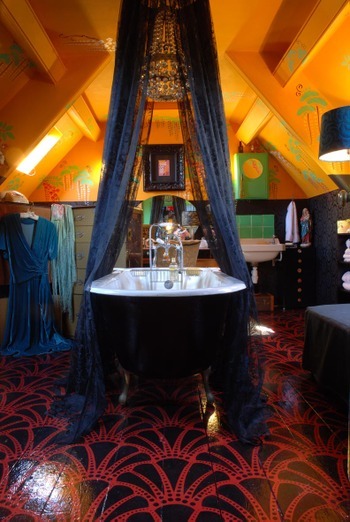 I also hung 4 black lace 90" drop panels on a hoop over the bathtub which can be pulled all the way around if wanted. They are polyester so I do not have to worry about water damaging them. I tried two new techniques in this room that I personally have not tried before. To read more about what I learnt from decorating this room, read on.... R.
Mirrors are great for creating the illusion of space and reflecting light. A giant panel has been made using mirror tiles. Two feather stencil designs from our Contemporary range, CO16 Feathers and CO23 Feather No. 2, have been stencilled using an Acrylic Frosting Varnish. Acrylic Frosting Varnish is a non-permanent frosting product which means it will not affect the glass. It is quite hardwearing and you can wipe over it as long as you do not use any solvent based products. Then, if you do fancy a change, you can use solvents to remove the design. It has been stencilled with acrylic paint. 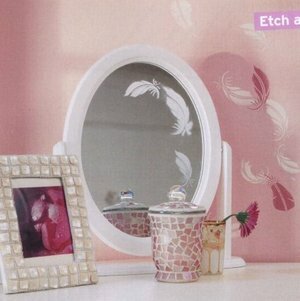 Acrylic paint is not permanent on mirror or glass so you will have to take care not to scratch the stencilling. However, the paint can easily be removed if you fancy a change. As long as you leave the stencilled areas alone, it will be fine. 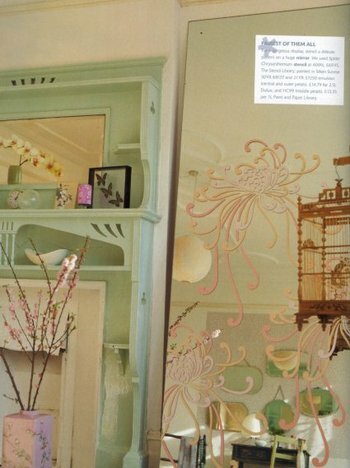 Here is another photo of stencilling onto mirror with paint from Home Beautiful magazine of Australia. A few simple butterflies (BB22) have been added to the top of the mirror, again with paint. 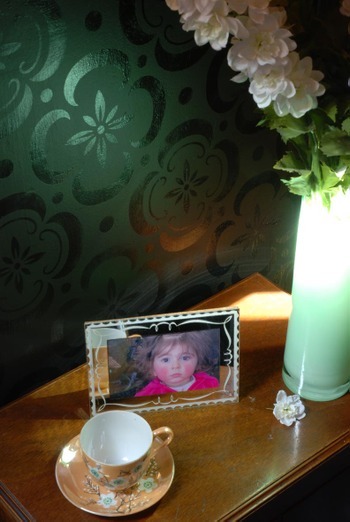 The stencilled image need not impede your ability to use the mirror. 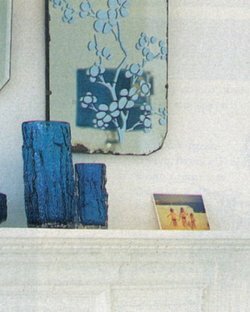 JA114 Bird & Blossom has been applied to the dressing table in blue. The same stencil has been applied to the mirror in Acrylic Frosting Varnish. The wall behind has been stencilled with our Lace Repeat stencil. 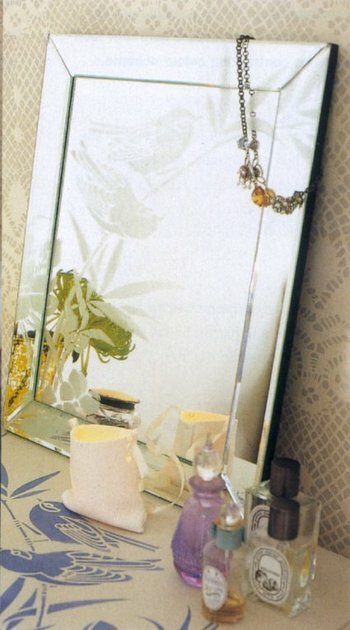 The curve of the TP26 Feathers featured on the wall work well with the curve of this oval mirror. 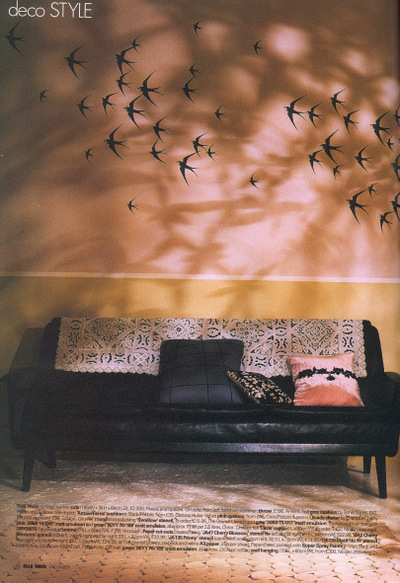 This photo is from Home Style magazine and the stencilling has been done with spray paint. Again, this is not permanent on glass, but as long as you take care with the stencilled areas, you shouldn't scratch the stencilling. This is a two layer stencil with the pineapple detail in the centre on the second layer of the stencil. The wood area of the cabinet has been stencilled as usual and then we have taken a repeat of the same stencil and applied it to the mirrored area using a permanent etching product called Etchall. This is a creme that eats into the glass so will give an authentic etched effect. Because it also makes the glass matt, we were able to stencil the pineapple detail on the second layer of the stencil using acrylic paint. 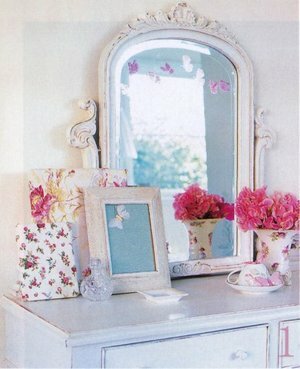 Finally, here is just one more photo showing our JA47 Cherry Blossom stencil done in a single colour on an antique mirror. Simple and quick and very effective. 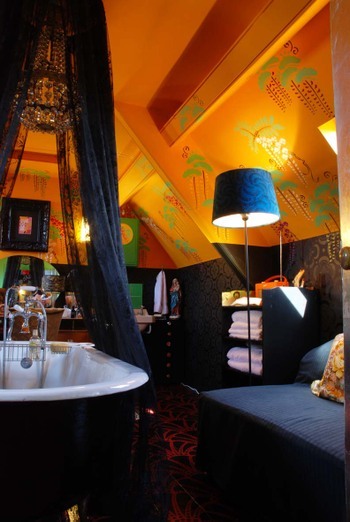 R.
I thought it was time to tour another of our guest rooms. 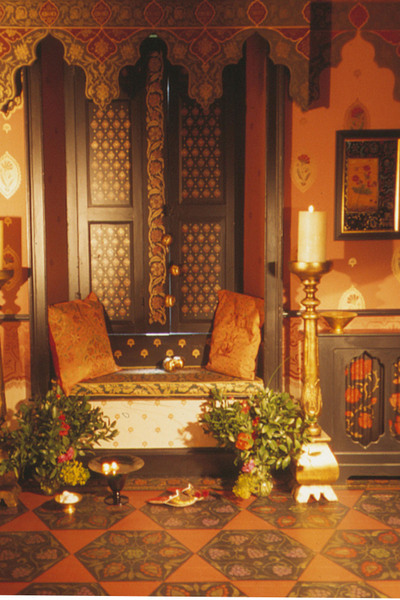 This is The Ottoman Room. 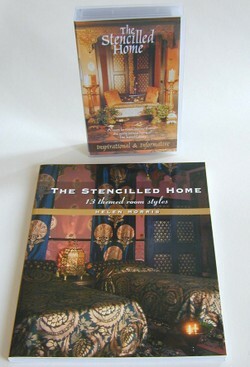 A photograph of it was used for the cover of our book The Stencilled Home and the DVD of the same name. 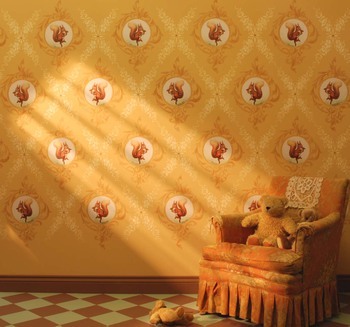 The room no longer exists, but in it's time,t was probably the most dramatic and arresting of the various rooms in our home. At dawn, the metallic paint and gilding come alive with light.....not that I have witnessed dawn too often! 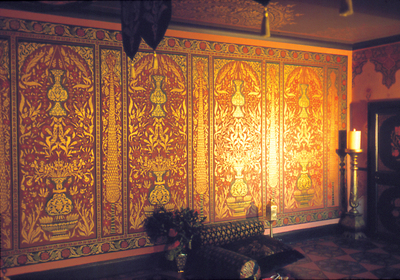 The designs are from the Ottoman Range at The Stencil Library. All the different areas of pattern have been confined within a border. 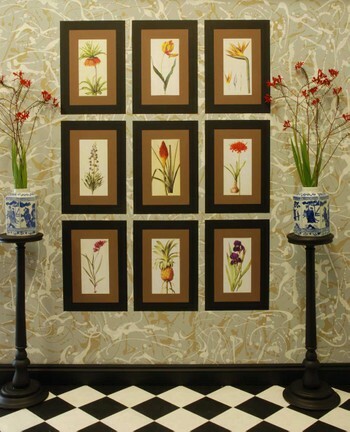 Sometimes the border is stencilled, other times it is provided by a wood or fabric trim. A deep border features on three of the walls (OTT1). Rather than break the run of pattern to accomodate a window we continued it by stencilling some MD fibreboard which my friend cut around to make a window pelmet. 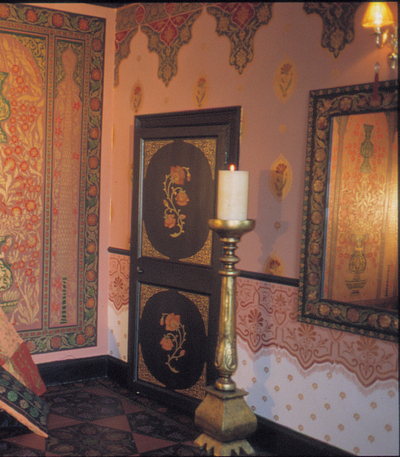 Most of the stencilling in this room uses just four colours: they are Hookers Green, Burgundy, Gold and Copper. 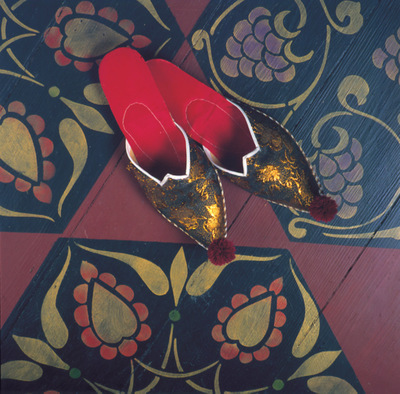 The floor was allowed an extra colour, Dioxazine Purple, which was applied to the grapes. We painted the sanded wooden floor with emulsion (latex) paint and then it was stencilled with OTT32 and OTT34. My mother did the work and it was the first thing she had ever stencilled. She complained that crawling around the floor hurt her knees so we tied pillows onto her legs and she completed the job. Sorry, Mum. The design on the bed covers is an enlarged OTT30 stencil. We used our copper and antique gold paints. 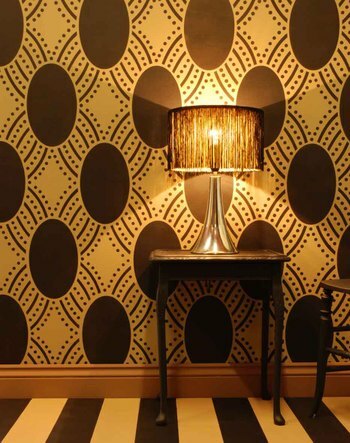 You may notice a bright gold colour in the pattern. 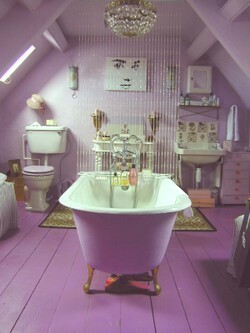 It was created by mixing a little of our rose gold powder in with the paint. All these paints can be washed and dry cleaned. 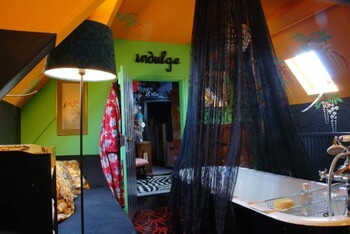 The bed covers are made from a combination of heavy cotton and velvet and are currently for sale in our shop. All our furnishings go there when a room is decommissioned. Between the beds a stencilled hat box has been used as a table and I threaded an halogen bulb into the centre of a metal Moroccan lantern. 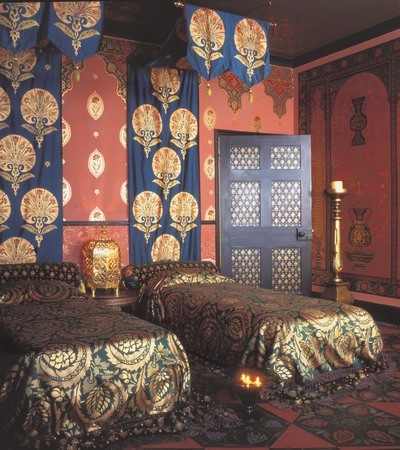 When illuminated the lamp casts shapes of metal tracery around the room throwing more pattern onto the silk canopies and ceiling. 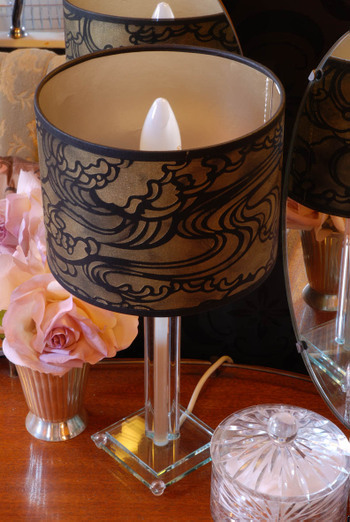 The lamp was gilded using Dutch Metal Transfer Leaf. 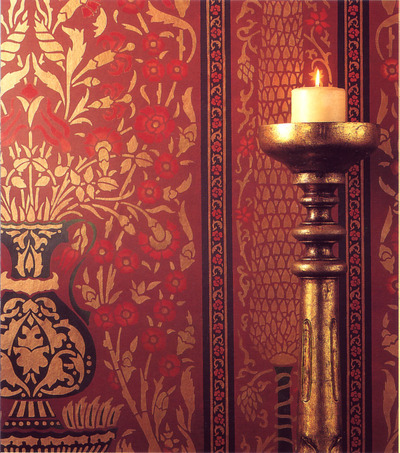 Our radiators were stencilled using the same paint as the walls, floors and fabric. The stencil has to be rolled in an out of the hollows in the radiator bars to keep the pattern unbroken. 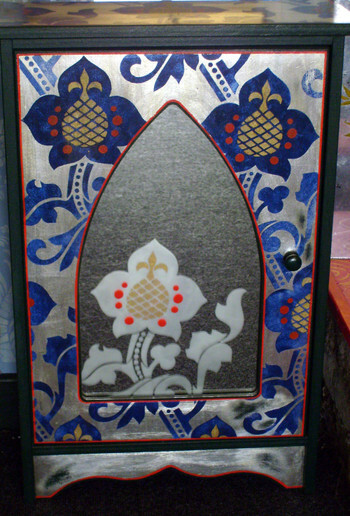 The same design was repeated on the wardrobe door and is an enlarged OTT45. 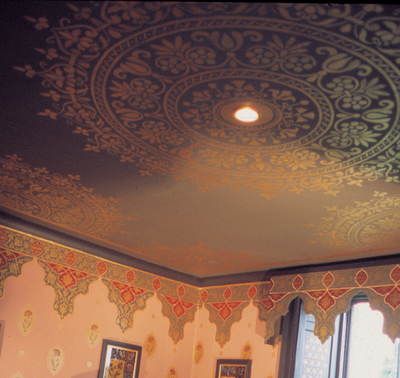 The ceiling was a monster to stencil. We used the OTT46 Quadrant stencil. 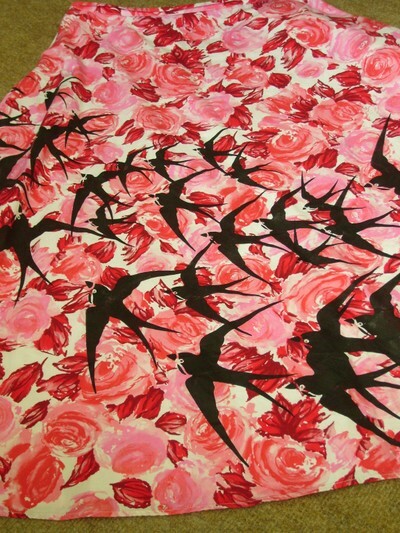 Wherever possible, I now chop very large stencils into smaller pieces or ask someone to help. This room has now been replaced with the comparatively minimalist Japanese Room. I'll take you there on a future post. Some of these photos were taken by Colin Poole -thanks, Colin. 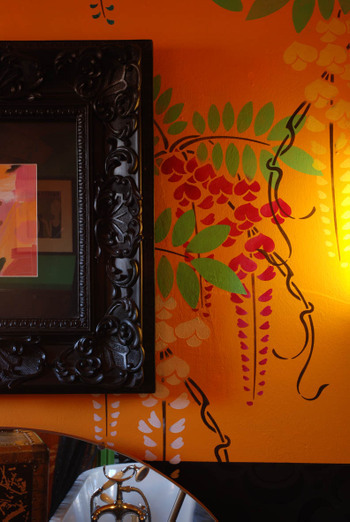 They appear in our Stencilled Home book. H.